How can you make sure that your children stay healthy? Your role as a parent is crucial all throughout the different stages of child development. If you want your children to live a healthy lifestyle, you must arm them with proper knowledge and guidance. You must act not only as a provider, but also as a model and regulator of their dietary choices. Studies say that children learn what, when and how to eat through direct experiences with food and by observing the eating behaviors of the people around them. Children of parents who consume healthier food such as fresh fruits, vegetables, and milk also have the same food preferences that they carry as they grow older. Eat with them and let them see your healthy food preferences as well as your regulated food intake. 2. Teach them to be independent. As your tot starts to explore the world around him, let him discover new flavors and make decisions for himself. Allow your child to choose from a variety of healthy food choices. Give him enough leeway as to when and how much to eat. Your little explorer may start by eating nothing or eating too much, but his innate ability to know when he’s hungry or not will kick in and guide him in determining his eating pattern. Eating something that he himself has planted will more likely add to his interest in fruits and vegetables. This also teaches him to be self-sufficient and hardworking. Include your youngster when making your grocery list and take him with you to the supermarket. Doing so will give him ownership of his food choices. Reading labels and comparing costs will teach him other lessons that he will need as he grows up. Have fun making meals together while learning about nutrition and health, among other things. 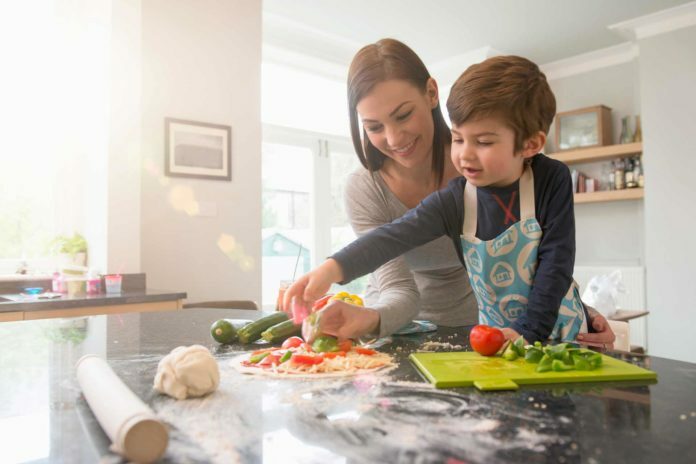 Aside from acquiring cooking skills, your child will also get to appreciate the value of preparing a good, healthy meal. Make your cooking time enjoyable by cutting up fruits and vegetables in fun and crazy shapes, for example. Your child will even be proud to show his healthy snacks in school! 6. Read up and share knowledge. Part of your child’s milestones is literacy development. Shoot two birds with one stone as you and your child read up on topics about food and nutrition. Share information in a way that is appropriate for his age and level of comprehension. 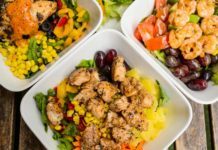 By learning about the benefits of good food, he will learn to appreciate and lean towards adopting a healthier lifestyle. 7. Get up and play. One important factor that goes hand in hand with eating healthy is to also have an active lifestyle. Encourage your child to play instead of being glued to gadgets, games or television. Eating while watching TV, for example, can also encourage “mindless” eating which could lead to weight gain. Kids over six years old should at least have 60 minutes of play a day to keep them fit. 8. Avoid putting your child on a “diet”. Be mindful of putting your child on a diet unless recommended by his doctor. Putting children on fad diets can lead to eating disorders. Work out a healthy meal plan instead and engage in physical activity. Healthy choices lead to a healthy, successful life. Healthy eating habits will need to be consistently taught and reinforced in family, school, and community environments. Ask any expert nutrition advisor and he will tell you that these strategies need to be done throughout childhood and adolescence as this will have a profound impact on your child’s well-being. As a parent, you want your children to be the best version of themselves. Equipping them with the correct habits toward maintaining a healthy lifestyle can help them reach their goals and succeed in life. With proper guidance in nourishing not only their bodies, but their hearts and minds as well, your children are well on their way to success.